Keyboard shortcuts make browsing very quick and easy. You can speed up your email checking in Windows Live Mail account using simple and easy Keyboard shortcuts. Windows Live Mail support different set of keyboard shortcuts – few Live Mail exclusive while other similar to keyboard shortcuts used in Yahoo Mail and Gmail. 1. Open mail.live.com to login into your Windows Live Mail account. 2. Then goto Options > More Options (at top right). 3. Click “Change keyboard shortcuts” under “Customize your mail” option. 4. Click to select “turn off keyboard shortcuts” to disable keyboard shortcuts. 5. Click to select “Hotmail and Outlook Web Access (OWA)” for Live Mail exclusive keyboard shortcuts. 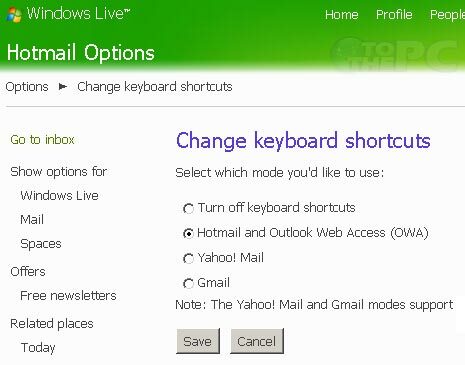 Select “Yahoo Mail” or “Gmail” option to use keyboard shortcuts of Gmail and Yahoo Mail in Windows Live Mail inbox. Checkout list of Windows Live Mail keyboard shortcuts for quick and easy browsing of email in Live email inbox.